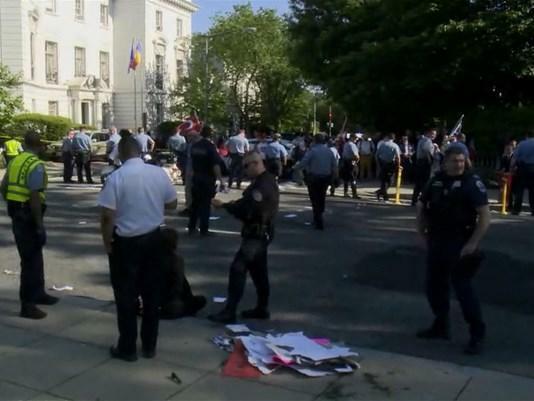 WASHINGTON -- A total of 19 people, including 15 identified as Turkish security officials, were indicted Tuesday by a grand jury in the U.S. capital for attacking protesters in May 2017 during a U.S. visit by Turkish President Recep Tayyip Erdogan. The indictments charge the defendants with attacking peaceful demonstrators who had gathered on May 16 outside the home of the Turkish ambassador, awaiting Erdogan's arrival after he had met with President Trump at the White House. The case threatens to further complicate already tense relations between the two NATO allies. Ankara strongly opposes the U.S. decision to arm Syrian Kurdish rebels fighting the Islamic State group in Syria. Turkey views the Syrian Kurds as an extension of its own outlawed Turkish Kurdish movement and opposes any moves that could lead to the formation of an independent Kurdish state. All 19 defendants are charged with conspiracy to commit a crime of violence, a felony punishable by a statutory maximum of 15 years in prison. Several face additional charges of assault with a deadly weapon. Sixteen of the defendants had already been charged on June 13; Tuesday's indictment adds three new defendants, all Turkish security officials. Two of the defendants were arrested in June and face an initial court hearing on Sept. 7. The rest remain at large. Several are members of Erdogan's security detail who returned with him to Turkey, so it is unclear if any will face legal repercussions in the United States. However, they could end up being threatened with arrest if they return to the U.S. If any are still in the country, they could be expelled if Turkey refuses to waive diplomatic immunity. Video of the protest showed security guards and some Erdogan supporters attacking a small group of protesters with their fists and feet. Men in dark suits and others were recorded repeatedly kicking one woman as she lay curled on a sidewalk. Another wrenched a woman's neck and threw her to the ground. A man with a bullhorn was repeatedly kicked in the face. After police officers struggled to protect the protesters and ordered the men in suits to retreat, several of the men dodged the officers and ran into the park to continue the attacks. In all, nine people were hurt. On the day of the violence, police detained two members of Erdogan's security detail but released them shortly afterward. Two other men were arrested at the scene - one for aggravated assault and the other for assaulting a police officer. American officials strongly criticized Turkey's government and Erdogan's security forces for the violence; the State Department summoned Turkey's U.S. ambassador to complain. The Turkish Foreign Ministry then summoned America's ambassador to protest the treatment of the detained security guards. Turkey's official Anadolu news agency said at the time that Erdogan's security team moved in to disperse the protesters because "police did not heed to Turkish demands to intervene." The Turkish Embassy claimed the demonstrators were "aggressively provoking Turkish-American citizens who had peacefully assembled to greet the president. The Turkish-Americans responded in self-defense and one of them was seriously injured." Tuesday's indictment states that most of the demonstrators were supporters of Kurdish independence but repeatedly maintains that their protest was peaceful and permitted. The charges all carry a "bias crime enhancement" which brings stiffer penalties because the attack was "based on the actual or perceived ethnicity and political affiliation" of the victims. The indictment says the attackers were a mix of "pro-Erdogan civilian supporters, Turkish security personnel, and staff members from the Turkish diplomatic delegation" and that they "significantly outnumbered" the anti-Erdogan protesters. It adds that the attackers "blatantly ignored American law enforcement commands to cease the violence."